< February snowfall drastically improved precipitation levels in Klamath County during the month of February, as indicated by this chart from the March 1 Oregon Basin Outlook Report by the Natural Resources Conservation Service. Seven of Oregon’s snow monitoring stations broke records for snowpack level for February, but drought conditions are still declared in some parts of the state. Every snow monitoring site in Oregon received above-average precipitation in February, with many reporting more than 200 percent of normal amount for February levels. Snowpack and stream flow forecasts predict adequate water supply for much of the state, though continued precipitation over the next several months will ultimately determine water supply abundance. 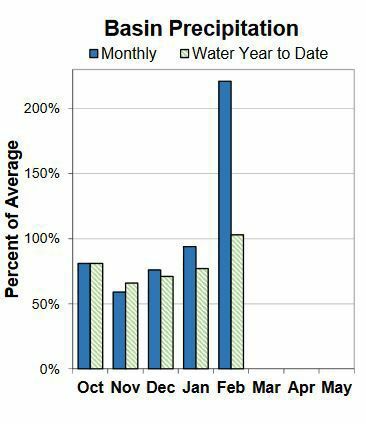 The U.S. Department of Agriculture’s Natural Resources Conservation Service (NRCS) released its Oregon Basin Outlook Report, which provides a current status of water supply, snowpack and forecasts as of data collected through the end of February. The report indicates that despite February being the shortest month of the year, consistent snowfall throughout the month significantly contributed to the water supply outlook across Oregon. While the situation has greatly improved since a statewide drought declaration was made last year, drought concerns remain. Extreme drought status has been lowered across the state as a result of February’s precipitation increase, but over 60 percent of Oregon still remains at drought levels of moderate to severe. Drought conditions remain most severe in Central Oregon, where the Hood, Sandy and Lower Deschutes Basin remain the only in the state below 100 percent of median for snow-water equivalent based on current Oregon Snow Telemetry (SNOTEL) sites. Snowpack levels in John Day, Lake County and Goose Lake basins reported the highest levels, nearly 150 percent of normal snowpack levels. Reservoir levels are generally below-average or average levels for March, with significant inflows expected as snowpacks melt, with spring and summer streamflow expected to be normal to well above normal in the majority of the state. Current Klamath County levels are reported at 119 percent of normal media snow-water equivalency, and 103 percent of water year-to-date precipitation. Lake County reports the highest levels of any in the state at 153 percent of normal media snow-water equivalency. The February snowfall made a dramatic change in Klamath County’s overall snowpack, which was at only 69 percent of normal to start February. The NRCS report shows basin snowpack now at 109 percent, with February precipitation at 221 percent of average. Reservoir levels range from 84 percent of average at Clear Lake to 123 percent of average at Gerber Reservoir. The NRCS Snow Survey is a federal program created to monitor snow and streamflow data and forecasts. A total of 81 SNOTEL sites are located around Oregon. Current SNOTEL reports are updated hourly at www.or.nrcs.usda.gov/snow.